Throughout my childhood, 5th Avenue was the center of my universe. It was where I watched my first parade and attended my first day of school. Where I worked my first job and spent the first dollar I ever earned. Most importantly, it was the street where all of Clinton, Iowa came together to shop, eat and celebrate. 79 percent say that preserving Main Street is important. We’ve known this for years. Historic preservation and the Shop Small® Movement are cornerstones of American Express’ longstanding commitment to serving communities around the world. These initiatives are strongly aligned. By rallying citizens to learn about their favorite local historic treasures, we believe we can create broad-scale awareness of the connection between preservation and our country’s thriving main streets. 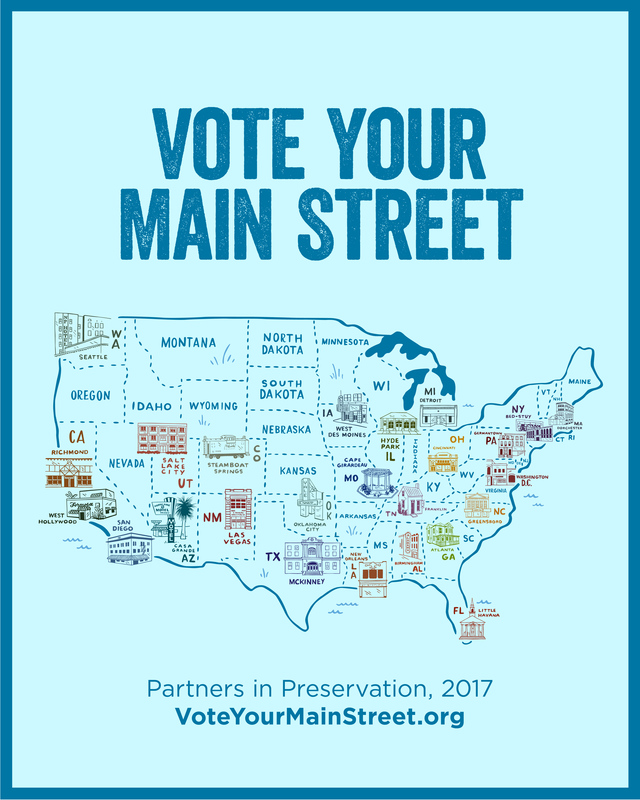 Today, in partnership with the National Trust for Historic Preservation and Main Street America, we announced that Partners in Preservation (PIP) is headed to Main Street! PIP is a community-based partnership to raise awareness of the importance of preserving historic places and their role in sustaining local communities. And this year’s program, PIP: Main Streets, has a new twist – for the first time in its 11-year history PIP will serve as a natural extension of the Shop Small® Movement. Throughout the campaign, historic sites in 25 Main Street districts across America will vie for $2 million in American Express preservation grant funding, as decided by popular vote. Through October 31, the public can vote for up to five main streets once a day to receive a share of the funding. The main streets with the most votes at the end will be awarded grants for historic restoration projects. Share your Main Street memories via social media using #VoteYourMainStreet. From theaters and museums to plazas and marquees, from Bed-Stuy to Birmingham, the sites participating in this year’s program reflect the diverse communities and experiences that comprise our nation’s cultural fabric. PIP is a call-to-action, inspiring local citizens to continue caring for historic sites at the heart of their communities. When we support our local historic sites and main streets, we drive development, preserve character, attract visitors and propel commerce. We encourage you to explore your favorite local Main Street and vote for it! If you have a question or comment, please follow me on Twitter at @timmcclimon and start a conversation there. Thanks for reading and sharing this blog posting with friends and colleagues. Morning Consult conducted an online survey of 2,201 adults from September 12-15, 2017. Results from the full survey have a margin of error of +/- 2%.